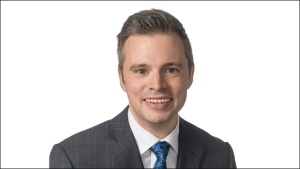 Kalin Mitchell is the chief meteorologist for CTV Atlantic. He has more than 10 years’ experience producing and presenting weather forecasts from coast-to-coast. Kalin's love of weather came upon him like a bolt from the blue, quite literally! He remembers watching thunderstorms over the Georgia Strait, which separates Vancouver Island from the mainland of BC. Even at the age of 10, these storms inspired him to learn all he could about lightning. This love of science led him to study physics, and then atmospheric science. Endorsed by the Canadian Meteorological and Oceanographic Society, Kalin holds a Bachelor of Science in Atmospheric Science from the University of British Columbia. He is also a graduate of the Meteorological Occupational Program, conducted by the Meteorological Services of Canada and Environment Canada. Kalin has provided expert commentary on weather for various media organizations, including The Weather Network and Environment Canada. He joins the CTV Atlantic team after ten years with the CBC. Kalin enjoys the challenge of the Maritime climate. He thinks of the region as the storm capital of Canada. Where else can a meteorologist watch for nor'easters, blizzards, and ice storms in the winter then tropical storms and hurricanes in the summer and fall? Kalin’s wife Jill says weather is also his favourite topic of conversation at home. Their young son Lochlan, and ever-energetic Border Collie Echo make sure Kalin gets lots of time outside, rain or shine. The Mitchells love exploring Maritime beaches and shorelines together. When you’re invited over for dinner, Kalin will grill up something delicious on the barbeque and serve it with one of his favourite local craft beers. Kalin is an avid hockey fan and is especially partial to the LA Kings. He watched his cousin, Willie Mitchell, win two Stanley Cups with them. Kalin is a proud member of the CTV Atlantic team, Maritimers’ #1 source for news and weather.